Prytherch asks in this chapter: What exactly does it mean to have legal right to the ROW? He begins by examining the critical role statutes play in regulating everyday mobility on the road as “traffic,” and how legislative assumptions and language mediate social relations among users. 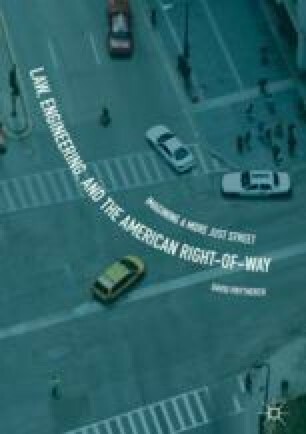 Returning to the UVC and state statutes modeled on it, he explores how laws construct mobility as the right-of-way or “right to proceed” in preference to others, mediating competing demands for roadway spaces. He shows how such statutes construct the power geometries of the street around the preferential right of the car, though pedestrians and bikes have right-of-way in other spaces like the sidewalk. The chapter then looks beyond the abstract framework set by statutes to how conflict and accidents on the roadway are adjudicated through the common law of torts, when judges must establish who has right and responsibility (defined as “duty of care”) and thus liability in case of accidents. The chapter highlights the ways statutory assumptions and biases are extended and elaborated by case law to socially construct—and unevenly allocate—mobility as a right and duty. Tefft, Brian. 2011. Impact Speed and a Pedestrian’s Risk of Severe Injury or Death. American Automobile Association Foundation for Traffic Safety. Washington, DC. https://www.aaafoundation.org/sites/default/files/2011PedestrianRiskVsSpeed.pdf. Last Accessed October 2, 2017.